I may have been under the weather this week, but luckily Marian wasn’t, which means catblogging goes on as usual. 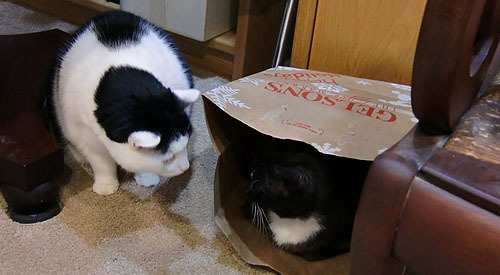 Today, Inkblot investigates the unusual sounds/odors/crinkling noises emanating from the shopping bag he’s sitting next to. Can you guess how this turned out?